Returning to his hometown after a stint in the Navy, Melvin “Wolf” Lobo never expected to have to become apprenticed to a sorcerer just to stay alive. 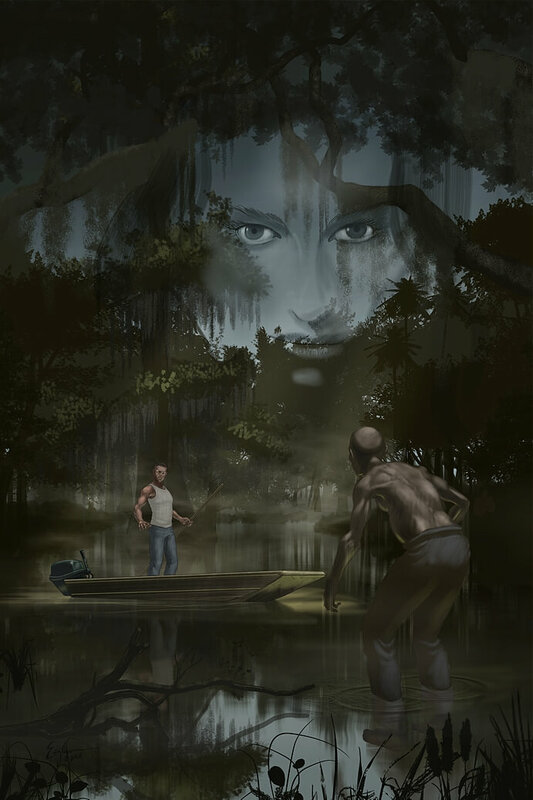 But the ghost he saw in the swamps as a child isn’t the only supernatural threat stalking the bayou. 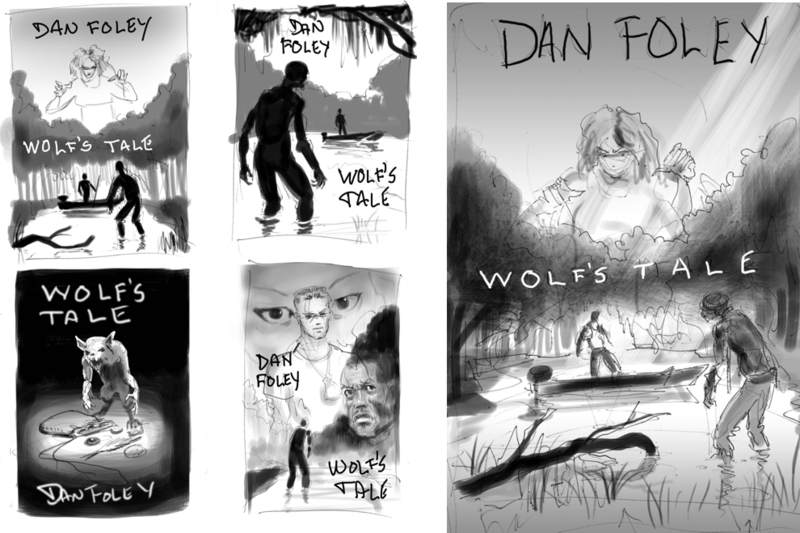 Ghosts, witches, walking corpses and demonic monsters stalk the pages of Dan Foley’s new novel, Wolf’s Tale. 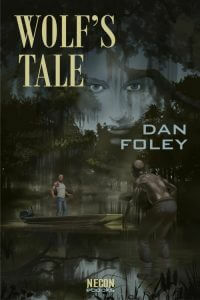 Wolf’s Tale will be my second cover for one of Dan’s books. I was blown away by his first novel, Death’s Companion, and when Necon Ebooks acquired it for publication, I was delighted to create an original painting for the cover. While it’s labelled “horror,” and certainly has horrific elements, to my mind, Death’s Companion is more of an urban fantasy. 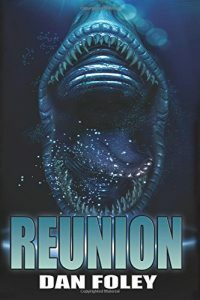 The “Companion(s)” of the title are like Reapers, without the quota – they’re just drawn to the dying as a sort of supernatural witness. 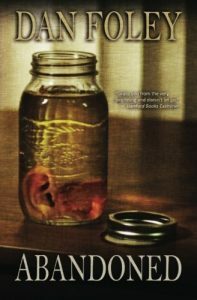 The book is a long one, broad and deep – it follows several protagonists through their lives, ranges from Maine to California geographically, and confronts a number of existential questions. 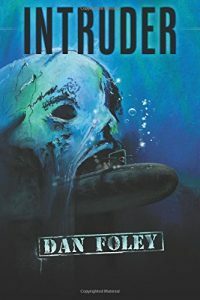 Dan’s Intruder is a tale of a nuclear sub haunted by the ghost of a Nazi submariner. Wolf’s Tale isn’t actually a direct sequel to Intruder, but then it is, sort of. 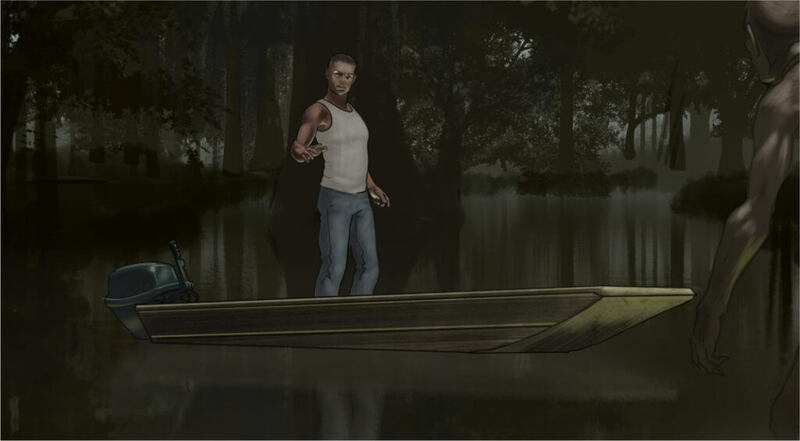 In the earlier book, the young Cajun seaman Wolf is a supporting character, though he provides the crucial key the actual hero uses to overcome the monster, when Wolf briefly recounts how he once met, and escaped from, a ghostly attack in the bayou. 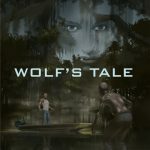 But Wolf’s Tale is exactly what it says on the box. 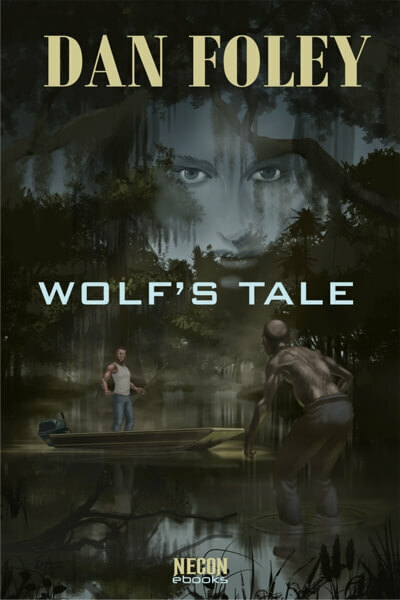 The novel begins with an expanded version of that incident Wolf relates in Intruder, and then jumps several years to when he musters out, returns home to Louisiana, and finds he must confront the haint he once escaped. 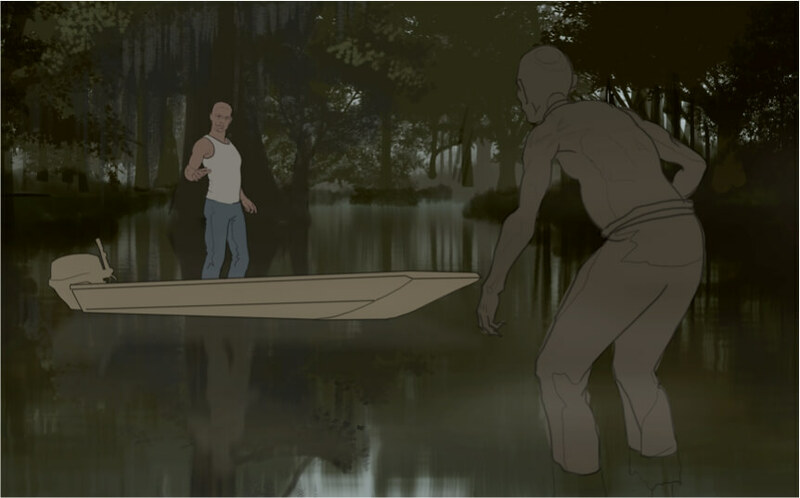 I dove into visual research on the bayou, cajun men, and what the heck was a jonboat, anyway? 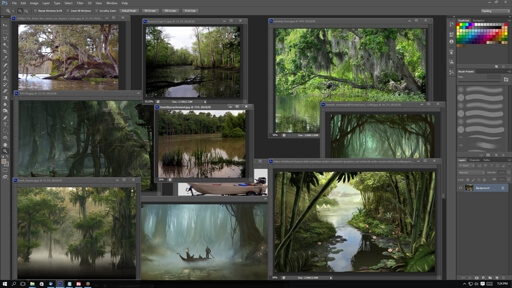 With a desktop full of various images, photographic and illustration, both – I started sketching. Although there were other interesting elements and scenes, Wolf’s story of his encounter with the undead Old Ben was an archetypal one, and it was the major link back to Intruder. Also, it was full of visual possibilities. 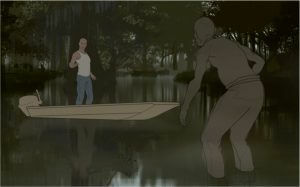 I looked at the scene from a variety of viewpoints, tried introducing other elements, but I kept coming back to this shot where you were looking over from behind where Old Ben is rising out of the swamp, looking at Wolf in his jonboat in the background, with this ghostly image of the witch woman overlooking them both. Once I’d settled on a basic composition, I used Daz 3D to check my perspective and lighting, and refined the sketch based on that information. 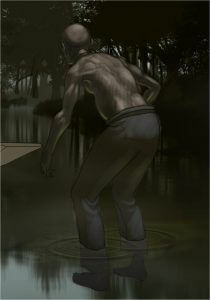 Moving to painting in color, the first step was to get the swamp blocked in. 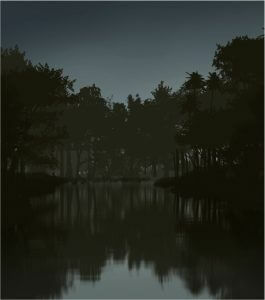 A variety of tree brushes gave me my basic silhouette, and I mirrored than and distorted using both motion blur and displacement maps to create the water reflection. I wanted some trees, roots, and Spanish moss in the foreground, but that would wait for later – I’m working back to front here, creating the background as a whole piece, so I can later move my figures around on it later, if I need to. In the next step, I blocked out the figures basic local tones. Then I started on the figure rendering. Old Ben came together quickly and easily. He was a little brushier (is that a word? It is now.) in places than I liked, so I went in with a blender brush to get rid of some of the hairier shading. Wolf took a little longer. He kept wanting to get too contrasty in the details, bad for a small figure on the canvas. I fudged out some of the detail, but couldn’t resist preserving a little of the greenish bounce light. 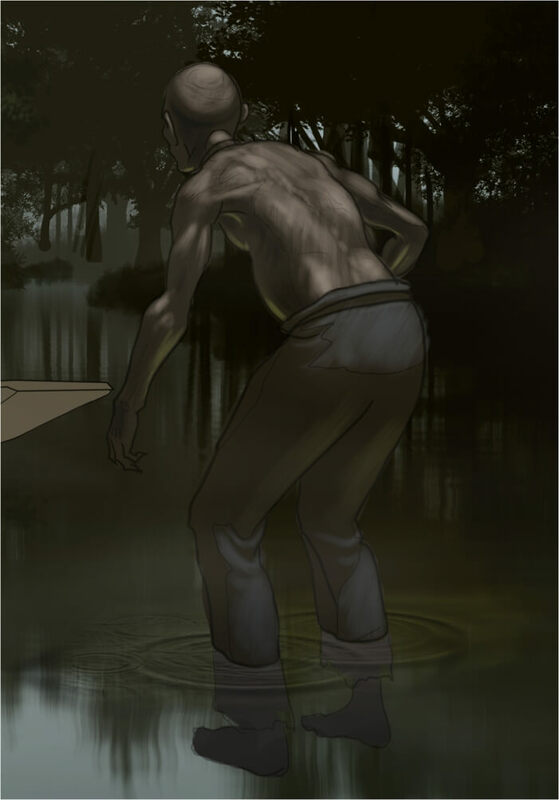 Originally, I’d had more intense greenish bounce light from the swamp water underlighting both Wolf and Old Ben, but that proved to look too cheesey Hollywood-esque, so I dialed it back quite a bit, and went for some obscuring fog here and there. Feeling Wolf needed a little more contrast to his background, I added some light beams and some glow on the water near his jonboat. 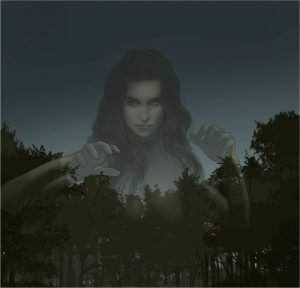 Next I went to work on the ghostly witch lady figure. It pretty quickly became obvious that she wasn’t not going to work the way I originally envisioned her – even semi-transparent, she was making the scene look like a poster for Attack of the 50-Foot Woman. But I didn’t want to let her go – she was important to the story, too. So I enlarged her, got rid of the extremities, and left just the central part of her face. This, to my eye, implied more of the personality and the will of the character, rather than the body presence. I added in some foreground trees and Spanish moss. At this point I also noticed that Wolf’s arm, though it looked okay close up, didn’t read well when you zoomed out to see the whole image. So I did a quick re-paint on his limbs, and gave him a boat pole in one hand. With the painting finished, it was time to add the type. My original plan for they type no longer worked to my eye. The title now seemed to divide the image in half, with Wolf and Old Ben in one picture and Renee, the Witch Woman in another. I wasn’t liking the division, so rearranged the type some. All in all, I was very pleased with the results. 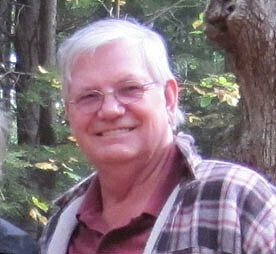 Matt Bechtel of Necon Ebooks was thrilled with it, and so was the author. 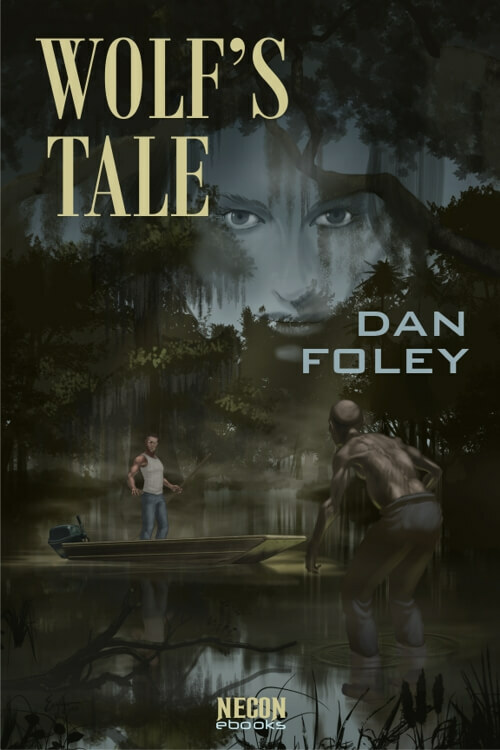 I was delighted to hear Dan say “That was the scene I was hoping you’d depict.” It’s always nice to hear your author feels you’ve nailed it.